The Nashville Sit-in Movement officially began with the first sit-in taking place on February 7th 1960. Yet, this was preceded by months of student participation in workshops, conducted by the Vanderbilt Divinity School’s own James Lawson. These workshops dealt with the discipline of nonviolence as espoused by Gandhi with specific reflection on the Christian faith and its role in bringing about peace and love. Born, then, from a profound emphasis on the teachings of the Christian tradition, the sit-ins served as a concrete response to the injustice of segregation in U.S. society. For the managers of these local businesses to deny service appears to be a small and insignificant act. However, when reflecting on the week's text of Deuteronomy 26: 1-11, we are made aware of how antithetical their action is in light of the spirit of word on which the Christian message rests. 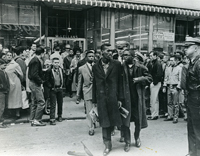 Scene from Nashville Civil Rights protests, from Art in the Christian Tradition, a project of the Vanderbilt Divinity Library, Nashville, TN. http://diglib.library.vanderbilt.edu/act-imagelink.pl?RC=54242 [retrieved April 24, 2019]. Original source: Vanderbilt University Special Collections.